The long awaited season is here! The all-encompassing aroma of Avrekaalu / Field Beans hangs thick in the air. 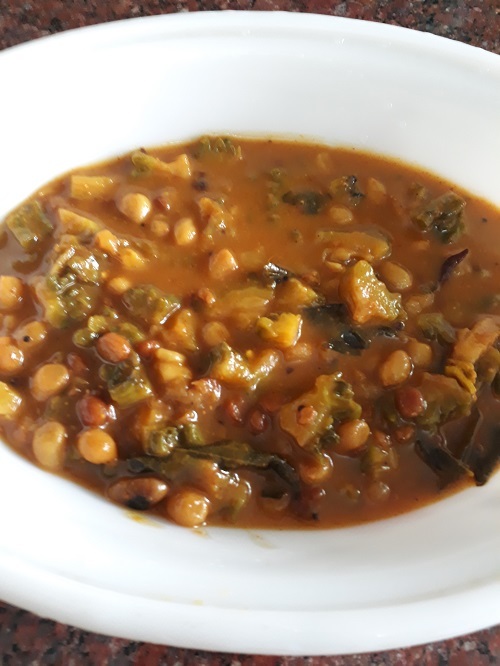 Every home is churning out Avarekai dishes to celebrate the season. 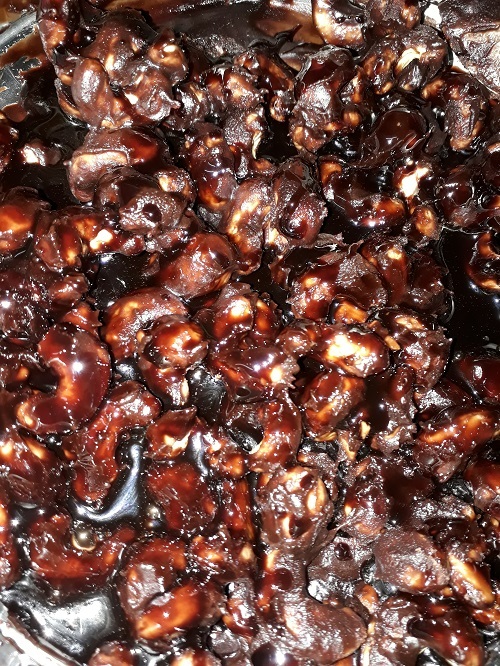 Hitukavare or Hitukubele is a delicacy and is a connoisseur's delight. 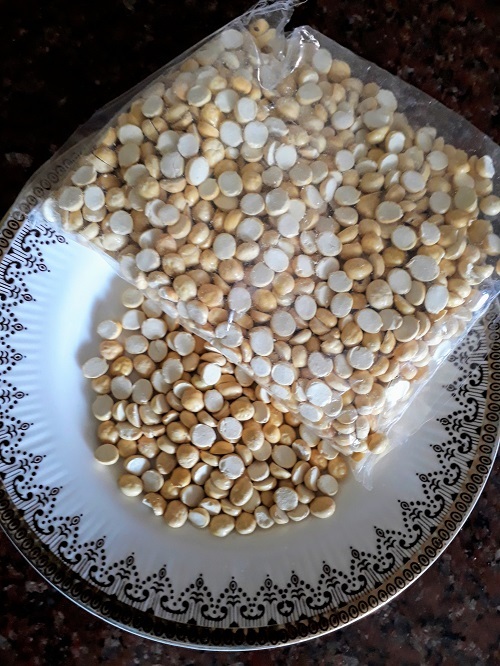 Field beans is soaked and then squeezed out or pinched one at a time and the 'raw lentil' thus obtained is called Hitukavare or Hitukubele. 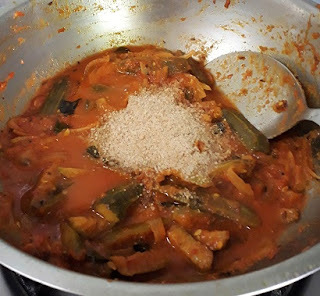 Here is a recipe for a hot and spicy Hitukavare Masala which is an ideal dish suitable for winter. Tastes delicious on a golden toast. 1. 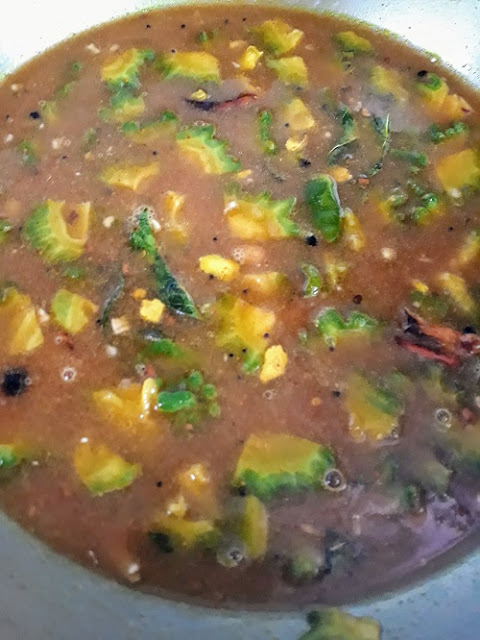 Boil the Hitukavare/Hitukubele (skinned field beans) adding turmeric powder till it is cooked. 2. Heat oil in a pan and splutter the cumin seeds. 3. Add ginger and onion and fry till the onion becomes golden in colour. 4. 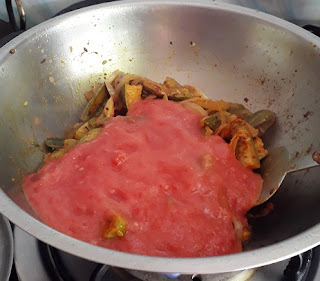 Add tomatoes, sambar powder and salt and stir well. 5. Cover and cook on low flame till the tomatoes become mushy. 6. 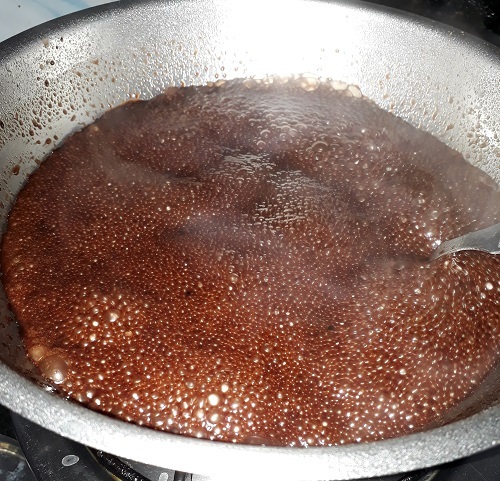 When the oil separates stir in the cooked and drained Hitukavare. 7. Slightly mash the Hitukavare Masala using the back of the ladle, cover and cook on low flame till the spice combines well with the bean and switch off flame. 8. Mix in the lime juice and garnish with chopped coriander leaves. Enjoy the hot and spicy Hitukavare Masala on toast. It goes well with dosas and poories. It can also be served as a side dish with any meal. 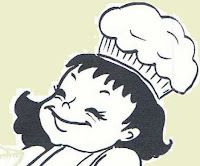 Marzipan is usually prepared by kneading together powdered almond and sugar until it reaches a play dough consistency. The sweet dough can be shaped into any shape like small marzipan animals or fruits. Addition of the required food colours make them more attractive. 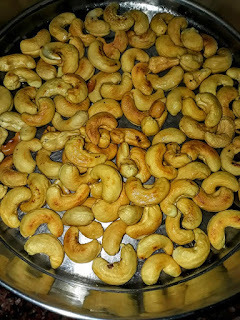 Some times cashew nuts, soy, semolina and other nuts are also used in the making of the sweet treat. Today I tried making Marzipan using Pottu Kadalai - Roasted Gram. 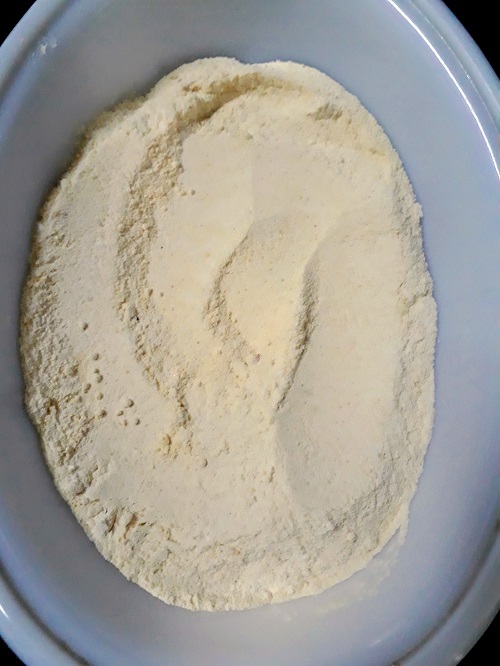 Since Pottu Kadalai is a dry ingredient a little quantity of melted butter or olive oil had to be used for binding. 1. Dry grind Pottu Kadalai/ Roasted Gram into a smooth powder. 2. 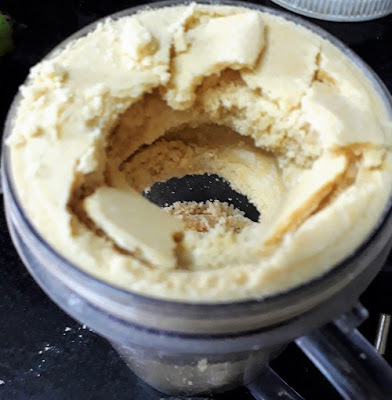 Grind sugar into a smooth powder. 3. Blend the powders, two table spoons of melted butter/olive oil and essence/cardamom powder together in a mixer. 4. 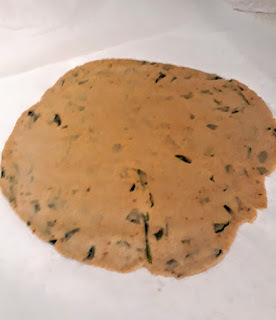 Take the blended mixture in a bowl and knead thoroughly into a soft and smooth dough adding more butter / olive oil if required. 5. 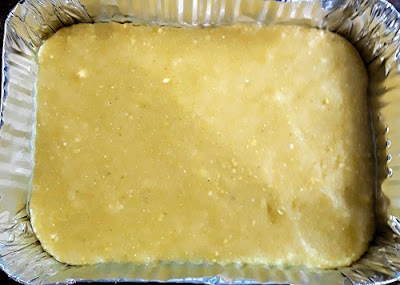 Pat the kneaded dough into a tray and refrigerate until the marzipan becomes firm. 6. Take out the set marzipan on a plate and cut it into desired shapes. 7. 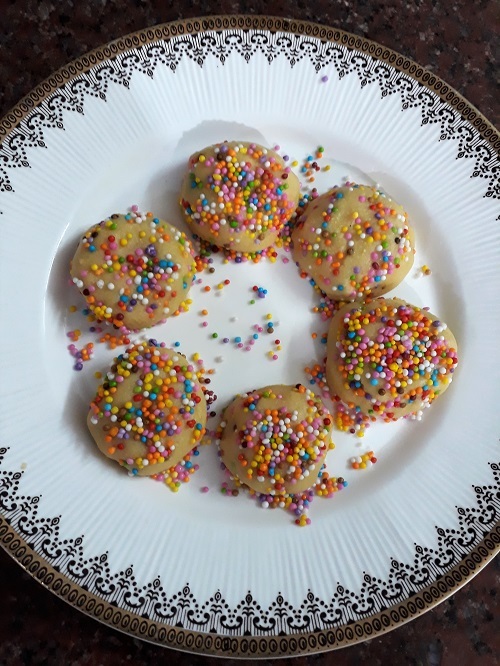 Marzipan can be made to look attractive by shaping it like cookies and showering the 'Marzipan Cookies' with rainbow sugar balls. 8. Keep them refrigerated and enjoy the chilled sweets with children and family. A combination of Gojju and steaming hot rice topped with a spoon of ghee is one of the best finger-licking meals suitable for a cold day. Pavakkai/Bitter gourd activates the digestive juices resulting in good digestion. 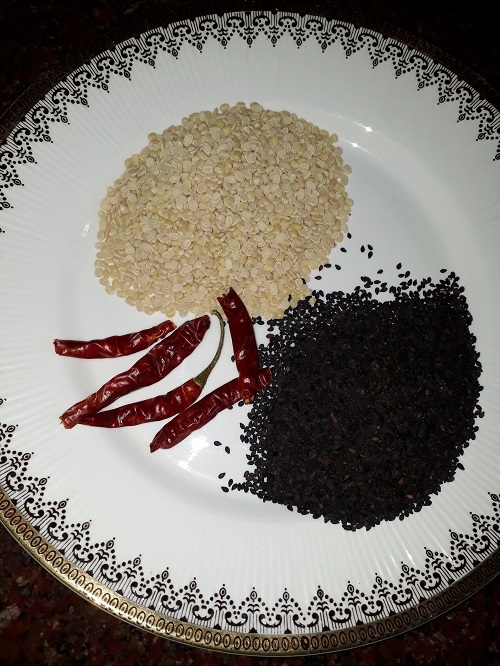 Ginger, chillies, sesame seeds and tamarind used in its preparation have heat generating properties which are important for improving metabolism and keeping the body warm. 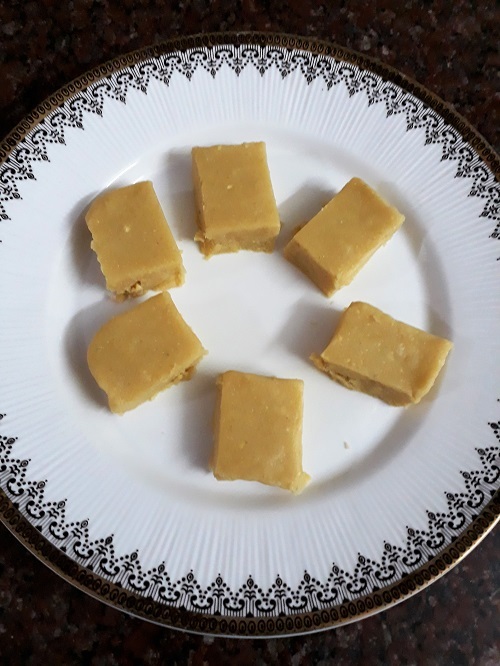 The spice, the tang and the sweetness of jaggery help to camouflage the bitter taste of the healthy vegetable. 1. 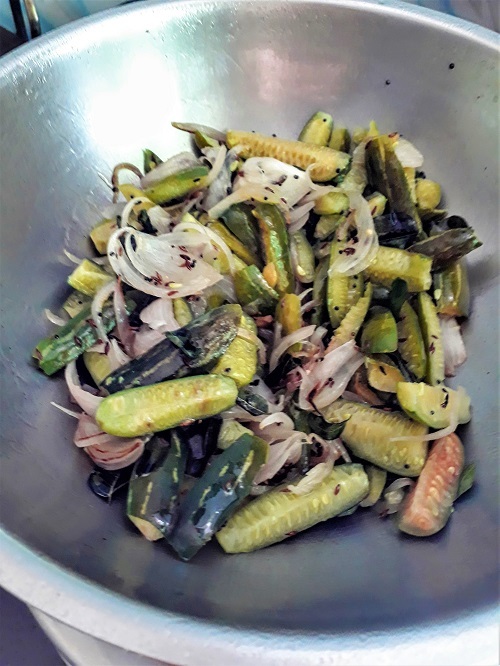 Wash and chop Pavakkai/ Bitter gourd into small pieces. 2. Soak tamarind in warm water and extract the juice and keep aside. 4. 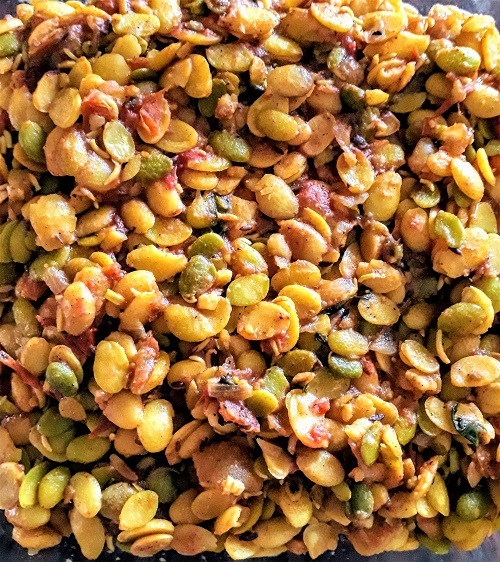 When the mustard seeds splutter add fenugreek seeds and Bengal gram dal. 5. When the dal starts to turn golden in colour add the peanuts and stir till they crack. 6. Turn down the heat and add red chillies, followed by slit green chillies and ginger. 7. Add asafoetida, turmeric powder and curry leaves. 8. Stir the seasoning well, increase flame and add the chopped bitter gourd. 9. Stir fry for five minutes and then add the tamarind juice, salt, sambar powder and powdered jaggery. 10. Cover and cook on medium heat till the gojju becomes thick emanating a very pleasant aroma. 11. 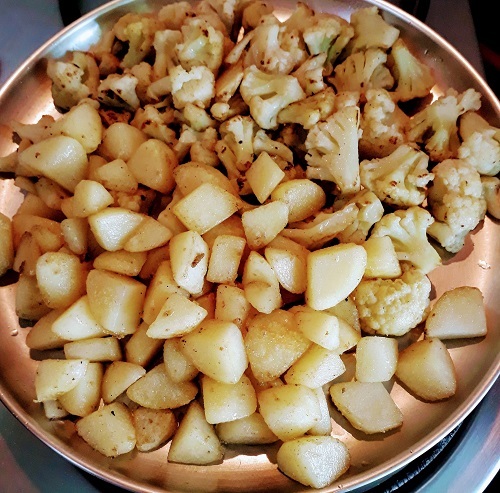 See that the vegetable is cooked and then add the roasted and powdered sesame seeds. 12. 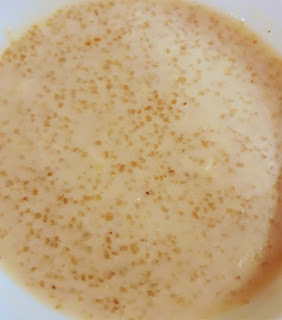 If you do not need a very thick gravy, make a paste with one teaspoon of rice flour and water and blend it into the gojju while still watery as soon as the vegetable is done. Enjoy the bitter- sweet, spicy - sour Pavakkai Gojju with rice or relish it with dosas or chapaties. Ellu or Sesame seeds provide heat and energy to the body and are a power house of nutrition according to Ayurveda. They are rich in calcium and zinc which are necessary to boost bone health. 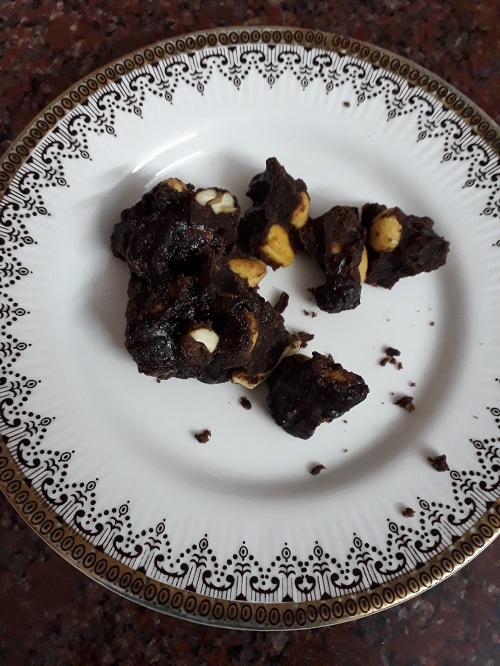 It is a custom to give Ellu Urundai/ Sesame Laddus to girls going through puberty.The calcium rich Ellu strengthens their bones and prevents osteoporosis. Ellu Podi or Sesame Powder savoured with a spoon of sesame oil tastes delicious with Idlies and Dosas. Ellorai is a traditional dish which has been an offering to the deities at ancient temples since time immemorial. 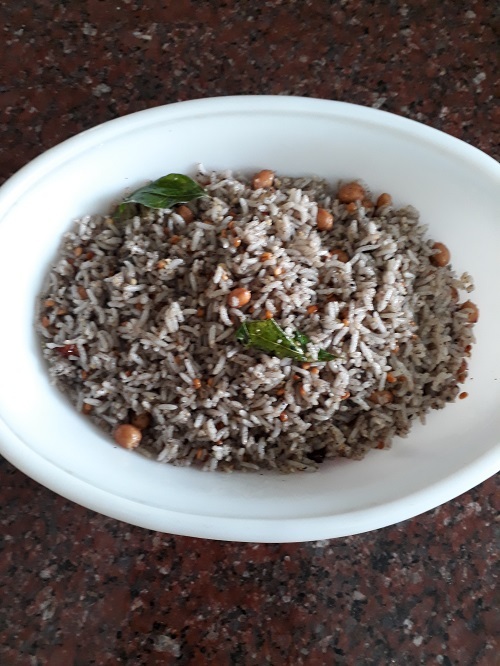 It is a delicious rice prepared by mixing the Ellu Podi with cooked rice. Enjoy the delicious heat generating foods prepared with Ellu/Sesame this winter. 1. Roast split black gram dal, red chillies and asafoetida in 1/4 tsp of hot oil. 2. 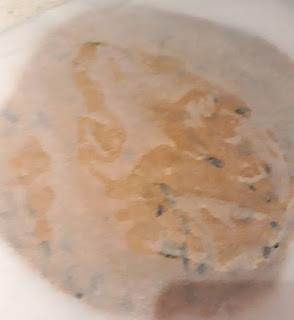 When the dal becomes light golden in colour emanating a very pleasant aroma add the black sesame seeds. 3. Switch off flame and keep stirring till the seeds pop in the hot pan. 4. Allow to cool and then blend the roasted ingredients together with salt into a slightly coarse powder. One or two swishes in the blender will be sufficient. Grinding for too long will extract oil from the sesame seeds. 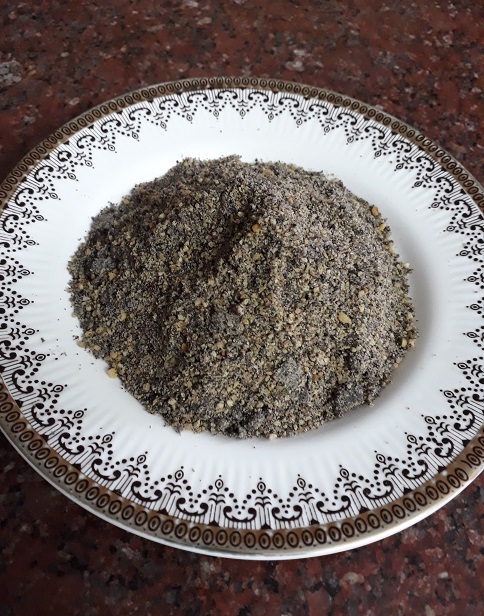 Ellu Podi/ Sesame Seeds Powder is ready to use. Store the powder in a clean dry bottle after it cools down. 1. Fluff up the cooked rice in a wide mouthed vessel. 2. Heat one tbsp of oil in a pan and splutter mustard seeds. 3. 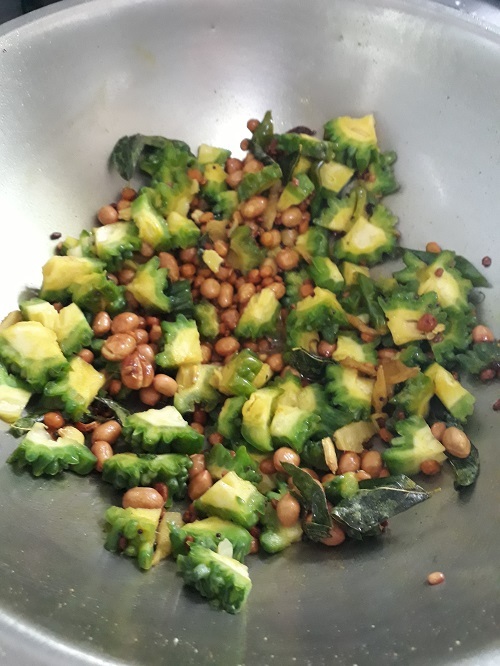 Add split black gram dal and peanuts and roast till the dal becomes golden in colour, and till the peanuts crack. 4. Add curry leaves and pour the seasoning over the fluffed up rice and mix well. 5. Add two tbsps of Ellu Podi, salt and the remaining oil and blend well with the rice. 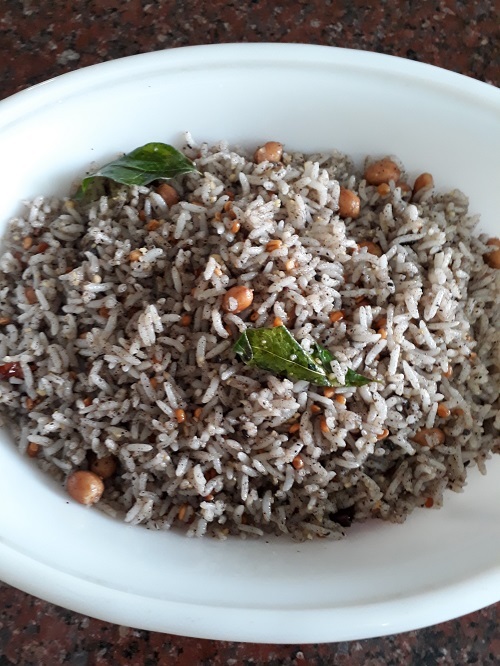 More Ellu Podi can be added according to taste. Enjoy the nutritious and flavoursome Ellorai as it is or with a roasted Papad. The youngsters in my family relish noodles very much. Whenever they have a craving for noodles or any other food they fancy for that matter, they readily order their favourites online. 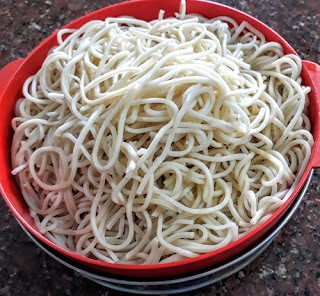 One fine day I decided to try my hand at making their favourite noodles at home, but of course with a South Indian touch. 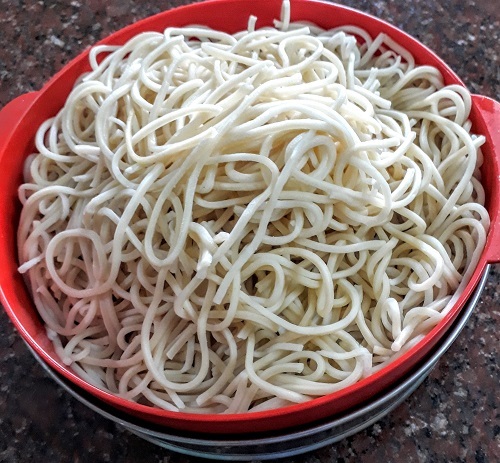 After much pondering the thought of combining noodles with any of the South Indian gravies seemed infeasible. 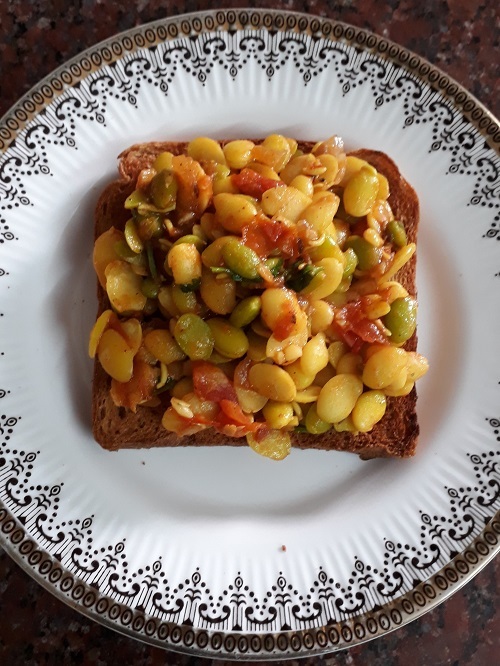 I remembered about Vegetable Dalna - a traditional Vegetarian Bengali recipe which I thought would probably suit my need of the hour. 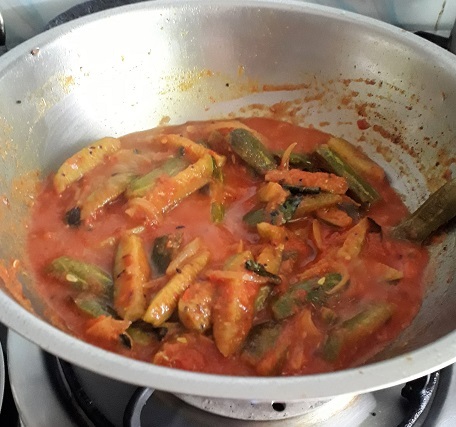 That is when Vegetable Noodle Dalna - a fusion of Bengali and Italian cuisine was born in my kitchen. Grind them together into a fine powder and keep aside. 1. Add a teaspoon of oil and a pinch of salt to a big pot of water and bring it to a boil. 2. Add the noodles to the boiling water and cook till done. 3. Drain and cool the cooked noodles and keep aside. 4. Heat 1 tbsp of oil in a kadai and fry the blanched cauliflower florets to a golden colour and remove to a plate. 5. Add one more tbsp of oil to the same kadai and roast the cubed potatoes to a golden colour and remove to the plate. 6. Heat the remaining oil in the same kadai and splutter cumin seeds and add the ginger paste. 7. 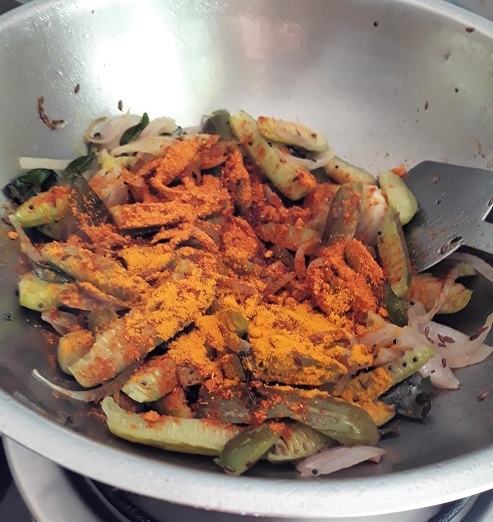 Mix Sambar powder, turmeric powder, salt, sugar and the spice powder with little water and add this paste to the seasoning. 8. Stir well and then add the tomato juice. 9. 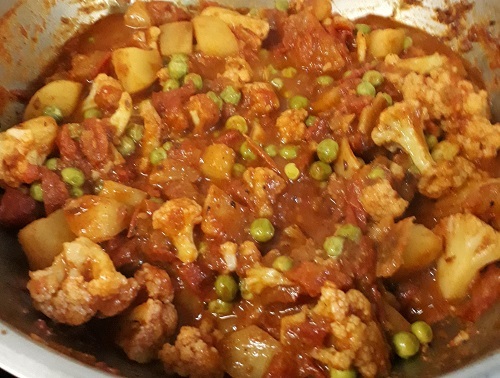 Cook till the oil separates from the sauce and then add the fried vegetables and peas. 10. Add 1/2 a cup or more of water and cook till the vegetables are done. 11. Dalna needs to be juicy and it should have the consistency of a gravy. Add little more water if it becomes too dry. Switch off flame when it emanates a very pleasant aroma. 12. 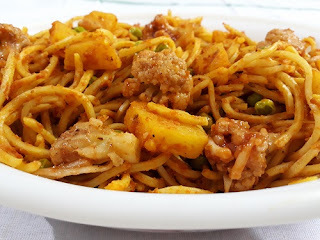 Gently mix the vegetable gravy with the cooked noodles till each and every strand of noodle gets coated with the dalna. Watch the sparkle in the eyes of the youngsters as they slurp in the Vegetable Noodle Dalna when it is still warm and juicy. Offering Payasam as Neivedyam is an integral part of Deity worship. Different types of Payasams are prepared by cooking different grains in milk or coconut milk and sweetened with jaggery or sugar. 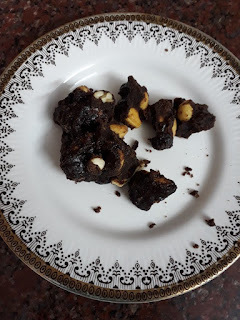 Some Payasams are better left plain while some others are garnished with dry fruits and nuts. 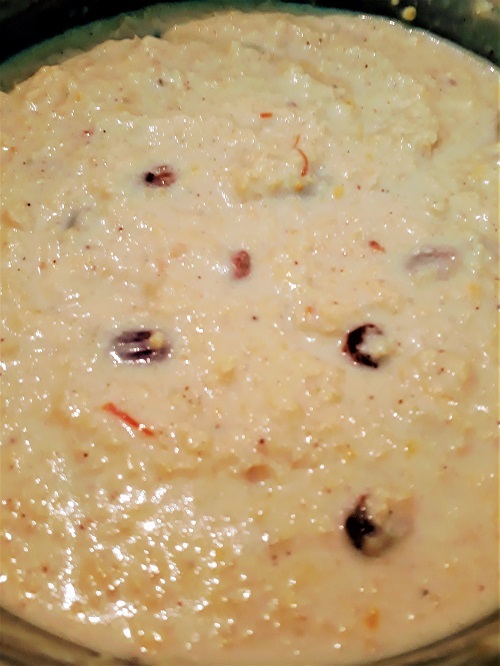 Goddess Shakti is offered a Payasam a day on all days of Navaratri along with the Maha Neivedyam/the main food offering. 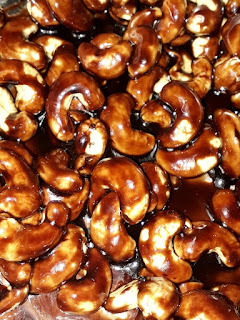 Here are recipes for two Payasams which can be prepared for the celebration. The first one is called Kaadaikanni Payasam in Tamil and Tokkegodhi Payasa in Kannada. 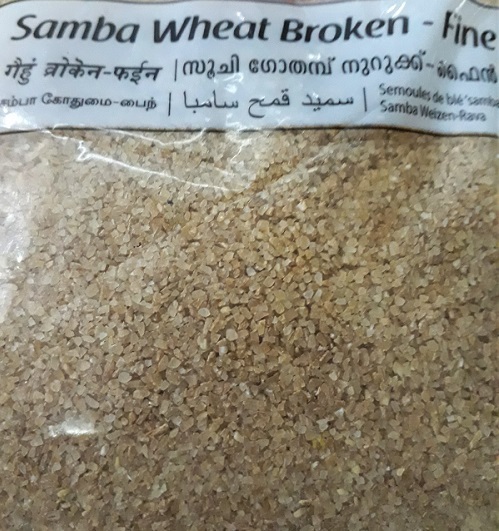 Kaadaikanni and Tokkegodhi are the not so familiar Tamil and Kannada words which mean Oats. 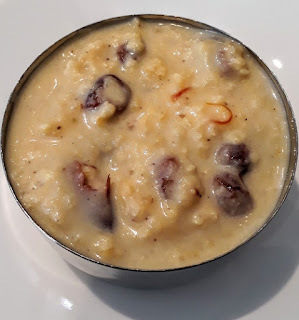 The second one is Samba Godumai Rava Payasam (Tamil) or Godhi Tari Payasa ( Kannada) meaning Broken Wheat Porridge. 1. Soak the saffron strands in one tablespoon of warm milk and keep aside. 2. 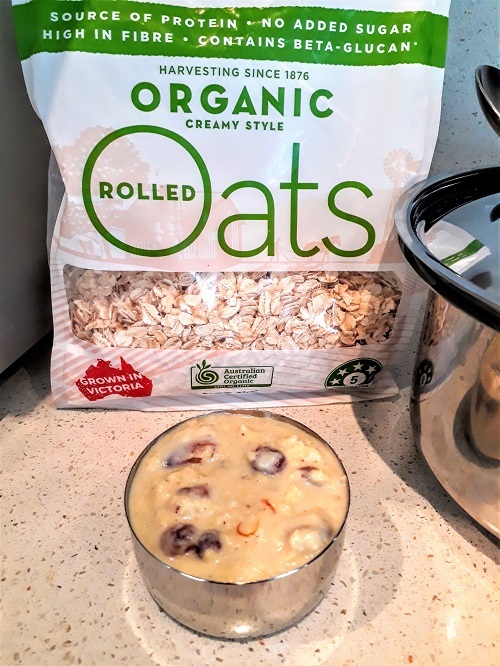 Heat one teaspoon of ghee and roast the oats till the colour changes. 3. 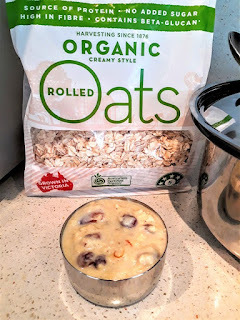 Add milk and cook till the oats become soft. 4. Add powdered jaggery and cook till it melts and blends with the cooked oats emanating a very pleasant aroma. 5. 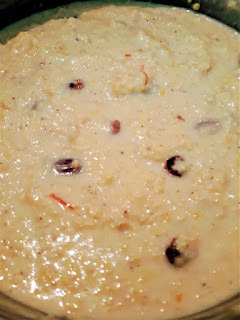 Add the soaked saffron strands along with the milk. 6. Mix in the cardamom powder. 7. Heat the remaining ghee and fry the cashew nuts to a golden colour, add the raisins and roast till they bloat. 8. 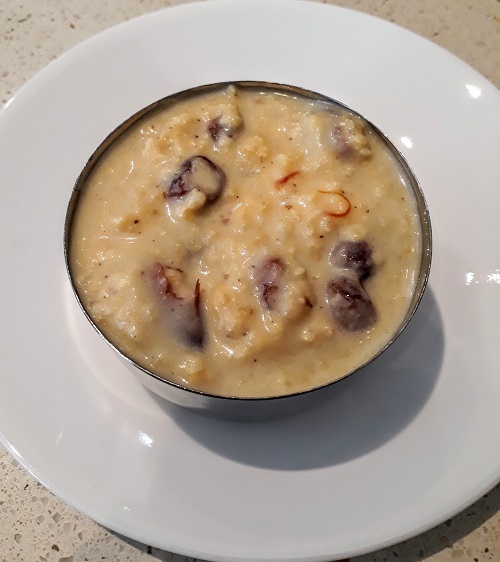 Garnish the thick Kaadaikanni Payasam with the ghee fried nuts and raisins. 1. 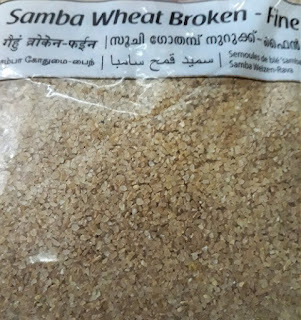 Heat ghee and roast the broken wheat till it emanates a pleasant aroma. 3. 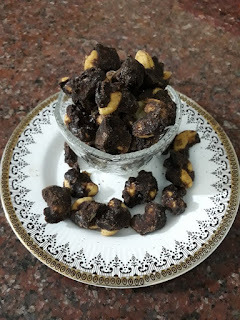 Add powdered jaggery and cook till the jaggery blends well with the cooked broken wheat. 4. Gently add in the coconut milk and switch off flame before the Payasam boils. 5. 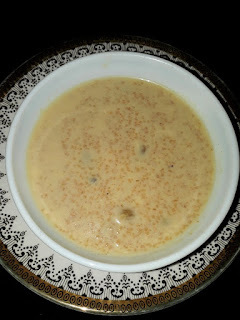 Mix in the cardamom powder and the powdered edible camphor into the creamy Payasam with flowing consistency. Garnishing with nuts and raisins is optional. Lalitha Sahasranama is a very ancient Sanskrit Hymn in praise of Mother Goddess and it is religiously recited by Her devotees during Navaratri Pooja. It consists of Her thousand beautiful names which describe Her various attributes including Her favourite foods. The line 'Gudanna preeta manasa' in the Stotra / Hymn describes her as 'The One who loves rice mixed with jaggery'. 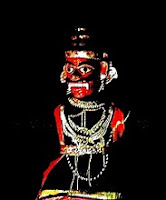 Offering Gudanna to Mother Goddess during Navaratri is considered very auspicious. Likewise another line describes Her as 'Haridraannaika Rasika' meaning 'The One who relishes turmeric or yellow rice'. Chitranna or Lemon Rice with its auspicious yellow colour rendered by the use of turmeric powder is one of the Maha Neivedyams offered to Her. Here are the recipes for two of the traditional Maha Neivedyams (main food offerings) offered to the Goddess during Navaratri. 1. Wash and soak rice for fifteen minutes and drain. 2. Heat one tbsp of ghee in a kadai and fry the drained rice till dry. 3. Add three cups of water and allow the rice to cook on low flame. 4. 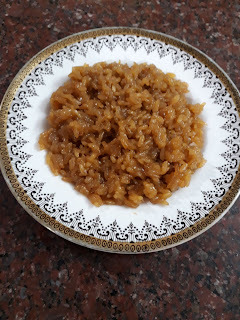 Add powdered jaggery when some water is still left in the cooked rice. 5. Cook till the jaggery syrup thickens and coats each and every grain of the cooked rice. 6. Stir in the powdered cardamom and edible camphor. 7. Add the remaining ghee and switch off flame. Offer it to Devi and enjoy the prasadam. 1. Pressure cook rice with two cups of water and allow to cool. 2. Spread the cooked rice on a deep plate (tambalam) and fluff it up to remove lumps. 3. Dissolve salt in lemon juice and keep aside. 4. Heat sesame oil in a pan and splutter the mustard seeds. 5. Add Black gram dal and Bengal gram dal and roast till the colour changes. 6. Add peanuts and fry till they crackle. 7. Add broken red chillies, asafoetida and curry leaves. 8. Stir in turmeric powder followed by the lemon juice and salt mixture. 9. Switch off flame and add the seasoning to the fluffed up rice. 10. Gently mix the rice with the seasoning without mashing up the rice. 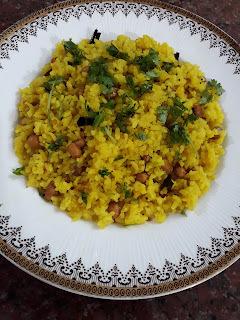 Garnish with chopped coriander leaves and offer the auspicious yellow coloured Chitranna to Devi and enjoy the Prasadam. Tondekayi / Ivy gourd is one of the vegetables I cook very often not only because of its various health benefits but also because the little gourds taste splendid in curries, chutneys, pickles and fries. 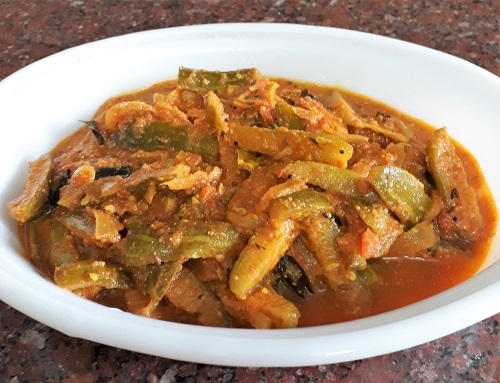 Tondekayi Tomato Masale Gojju - today's lunch special - is a spicy finger licking Ivy Gourd gravy which pairs very well with all types of rotis. 1. Chop off both ends of Tondekayi / Ivy Gourds and cut them lengthwise. 2. Boil the cut gourds in sufficient water for ten minutes adding a pinch of salt, drain and keep aside. 3. Peel and sliver onion and ginger, slit the green chilly and keep aside. 4. 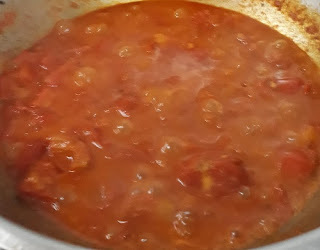 Chop tomatoes, blend in a mixer and keep aside. 5. Dry roast sesame seeds and grind into a fine powder and keep aside. 6. Heat oil in a kadai and splutter mustard and cumin seeds. 7. Add the slivered onion, ginger and slit green chilly followed by curry leaves. 8. When the onion turns pink in colour, add the semi cooked Tondekayi/Ivy gourds. 9. Saute till the moisture evaporates and then add turmeric powder and sambar powder. 10. Stir well for a minute and add the juice of tomatoes. 11. 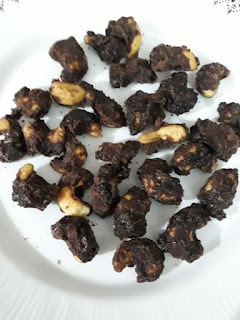 Cook till the gojju emanates a pleasant aroma. 12. When the oil starts to come out add 2 cups of water, salt and the roasted and powdered sesame seeds. 13. Cook till the spices blend together and the gojju reaches the required consistency. 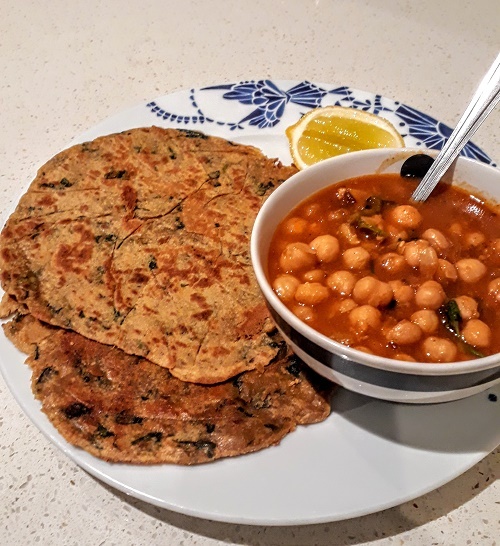 Enjoy the Tondekayi Tomato Masale Gojju with your hot hot rotis. 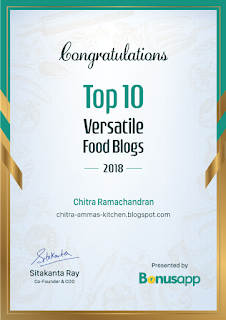 I am happy to announce that Chitra Amma's Kitchen has crossed another milestone in its journey as a Food blog. Amidst various other preoccupations at the home front, the blogger in me has had a very creative and productive phase in the last few months. 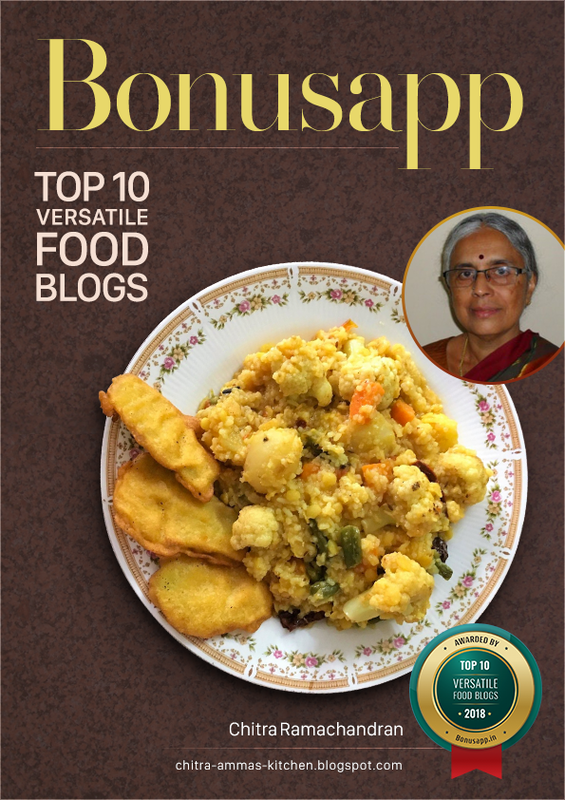 Aval Kitchen - a Tamil monthly magazine - has featured four Karnataka Recipes by Chitra Amma in their June issue. Here is the link. 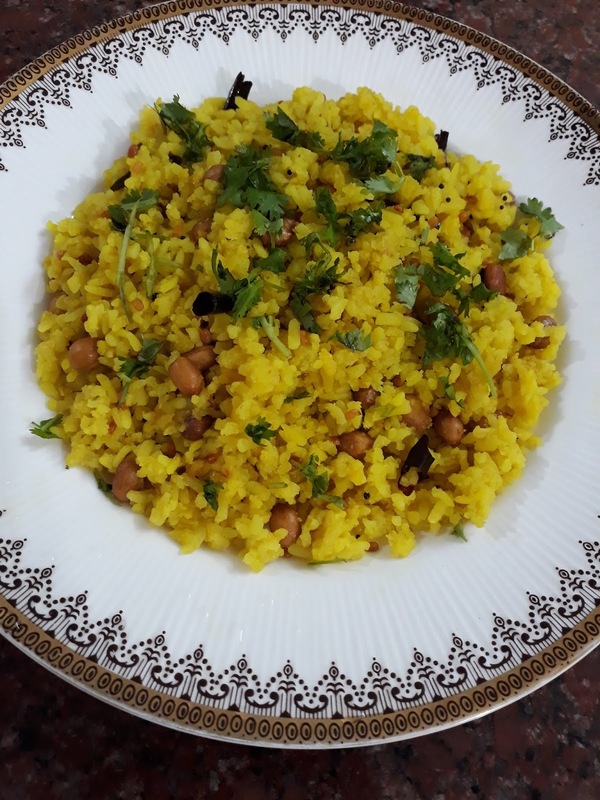 The food pictures and the cooking videos shot by Pranav Calapatti published in the digital version of Aval Kitchen were highly appreciated. Secondly Chitra Amma's Kitchen has won the 'Top Ten Versatile Food Blogs Award' for the year 2018 instituted by Bonusapp.in. The special effort gone into creating the award certificate and the poster is highly laudable. Last but not the least I am overwhelmed by the mails and messages of appreciation that have been pouring in since then! Thank you for the continued support and encouragement you have been giving to Chitra Amma's Kitchen. It is the interaction with my well wishers that inspires me to continue blogging. Posting here the recipe of Rajgira Roti on an admirer's request. 1. Mix salt and Sambar powder into the Rajgira flour. 2. 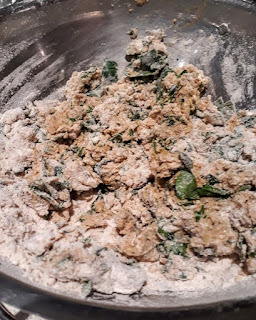 Add the chopped spinach and mix well. 3. Add one spoon of oil and add hot water little by little as you start kneading. Hot water makes it easy to bind the non glutenous flour together. 4. Keep kneading till the dough becomes soft and pliable. 5. Add the remaining oil and gather the dough into a soft and smooth ball. 6. 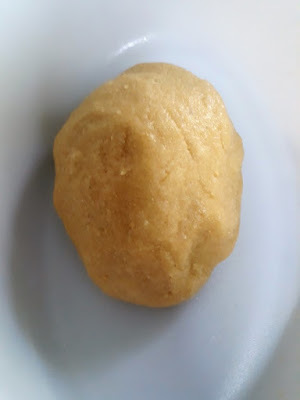 Take a lemon size ball of dough and place it in between two greased butter papers. 7. 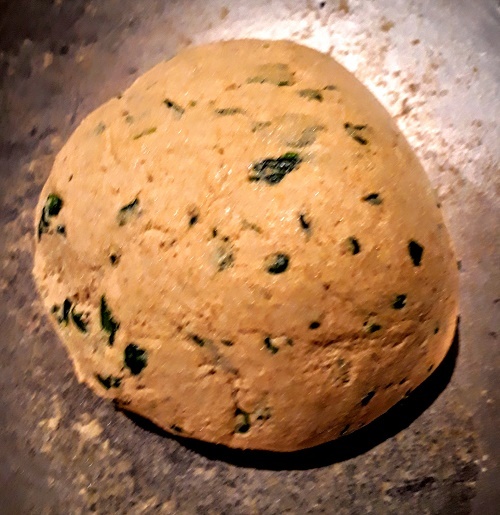 Roll out using a rolling pin into a moderately thick roti. Do not bother about the uneven edges. 8. Remove the butter paper on top of the roti. 9. 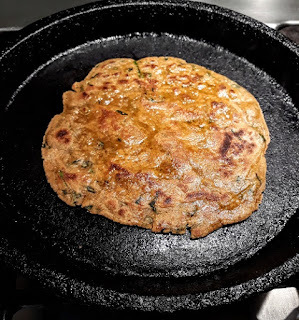 Gently lift the roti along with the butter paper underneath and invert it on a greased and heated tava. 10. Carefully peel off the butter paper which is now on top. 11. Cook on both sides dribbling little oil, flipping now and then till the roti becomes golden brown on both sides. 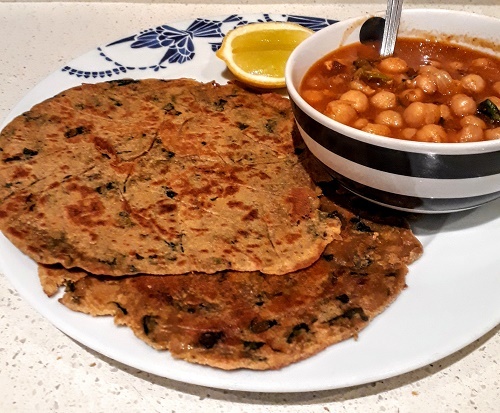 Enjoy the hot and nutritious Rajgira Roti with any side dish of your choice.